I was in the kitchen quite a bit this weekend. 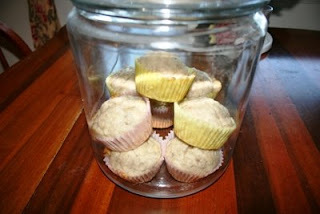 First up, I made a batch of banana muffins to have around for easy breakfasts and snacks this week. I totally cheated and used the bisquick muffin recipe- I just added mashed banana to the wet ingredients. They came out ok- not quite as sweet as I would have liked, but putting cream cheese frosting on them fixed that right up! Next, I decided to make a batch of home made cinnamon rolls. Dev really likes them and although the are EVIL to have around, I made them anyway. Just use a basic white bread dough recipe (I used my Dad's). After the first rise, roll the dough into more or less a rectangle (mine is never a rectangle- more like some sort of Rorshact(sp) dough blob experiment)then slather it with butter or margarine (I used Brummel and Brown Yogurt Spread) and brown sugar mixed with cinnamon. Use a serrated knife to cut the roll into slices. One recipe of bread dough made about 12 slices. I put 6 slices into one 8 inch cake pan (greased very well) and 6 slices into another. Preheat the oven to 350 and put the rolls on top of the stove with a towel over them, so they can rise a little before you park them in the oven for 30 minutes. While the rolls are baking, make a batch of cream cheese frosting, then cover the hot from the oven rolls with the icing. OR you can frost them individually as you eat them. We do this because we can't (well we could but we shouldn't) eat the whole pan at one sitting. Tonight's dinner was left over mac and cheese and smothered pork chops. Again, I totally cheated on the chops. I used rib chops on the bone, about an inch and a half thick- salted them and dredged them in a little flour, seared them in my new skillet, and removed them to a plate. I added chopped onion to the skillet and let it soften up for about 3 minutes. I deglazed with a little white wine, then dumped half a bottle of Cattleman's BBQ sauce in the pan. I stirred it around a little, put the chops back in to finish cooking and popped on the lid. By the time I had the mac and cheeese reheated, the chops were cooked through. I didn't take pics because I didn't remember to until we were half way through dinner. They were really good, and I'm sure I'll use this technique again! I wonder what trouble I can get into next weekend??? 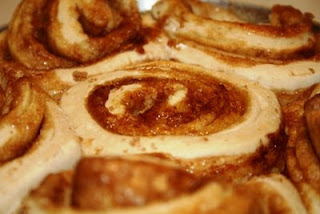 I have a cinnamon roll recipe to die for...can mix it all in bread machine!